In the original World of Darkness, the were-folk fought the Wyrm for a long time, and that battle raged through the Old West for a time. 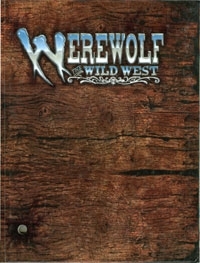 With an all-star cast in the writing credits (Justin Achilli, Nicky Rea, Phil Brucato, Rich Dansky, Jackie Cassada, Tim Byrd, Heather Heckel, and many more), Werewolf: the Wild West is a wild run through the Wild West and a fine entry for our Go West, Young Gamer Week. Blood’s been spilled on these plains by the gallon. There’s no fort or camp so strong they can keep us out. We’re stronger than the buffalo, deadlier than the rattlesnake. We can’t be killed by lead nor flint. There’s a storm thundering on the other side of the sunset. And there’s something coming to eat it. It’ll have to get through us first. As we mosey on through Go West, Young Gamer Week, this neat piece from Dog House Rules stands out as mighty useful for anyone running a Western game. It’s especially helpful if that game is Savage, whether it’s Deadlands or a more traditional romp through the Savage West. Whether you’re running it in SW or not, there’s over 150 pages of detailed material fully fleshing out this frontier fort and town for you to set a band of cowboys and adventurers bound for the promise of freedom and discovery beyond the Mississippi. 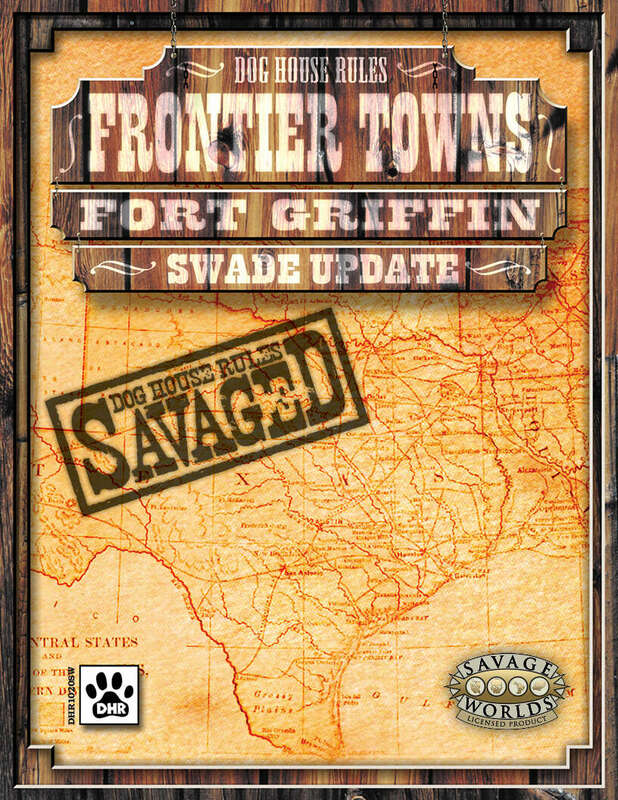 Check out Frontier Towns: Fort Griffin (Savaged)! This Wild West setting is a completely re-visioned version of DHR’s Fort Griffin, Texas setting, designed for Savage Worlds. The Savaged version of Fort Griffin contains all 17 fully-described establishments, 90 NPCs (historical and fictional), and more than 100 adventure hooks (with DHR’s world-famous “Forks in the Road” alternatives for many of the hooks). This whole kit and caboodle contains all new maps, Setting Rules, historical sidebars, and a passel of weird ideas. Fort Griffin main document – 154 pages containing descriptions of the town — affectionately known as The Flat — with detailed establishments, embedded maps, personalities and plenty of adventure hooks to keep players busy for ages. The Flat Personality Pack – 37 pages, containing character “cards” to aid the Judge in a fast and furious game pace, whether gunfire breaks out or because a PC interaction with a prominent personality needs a quick-as-lightning Trait test resolution. The Flat Map Pack – A set of files with all the maps a Judge might need, including tiled versions for printing a tabletop map (with or without a grid) as well as VTT versions for folks who prefer one of those newfangled electronic tabletop contraptions. Every establishment comes with a thorough description of its history, current proprietor and other notables, as well as maps and room-by-room details. The personalities that make each place come alive are furnished with statistics for Savage Worlds. And a number of important characters have original illustrations to boot. Even if a Judge prefers not to use the stats, or decides to cherry-pick favorite elements for addition to an existing milieu, there’s plenty of content packed in those pages to make Fort Griffin Savaged suitable — and downright useful, we hope — for any Wild West game. Fort Griffin Savaged comes with the following establishments designed for a hootin’-hollerin’ time in an Old West burg. A word to the wise, pard, things ain’t always what they seem . . . .
Last but not least, Fort Griffin Savaged contains a final chapter with personalities and adventure hooks, titled Just Passing Through and Tying It All Together. We reckon the chapter title is sufficiently self-explanatory. There’s an interesting “sub-genre” where Asian fantasy runs smack into the Wild West and mixes it up beautifully; I was introduced to it via a strange and fun movie called “Bunraku,” and I know there are many others (we are, in fact, watching “The Good, the Bad, the Weird” this coming Wednesday for our Evil Beagle Movie Club showing). 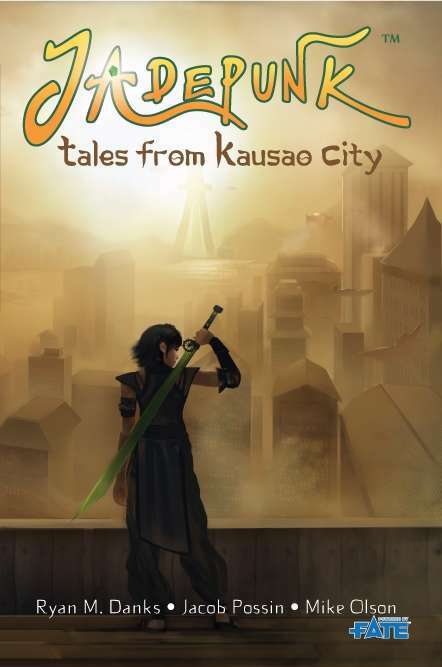 Naturally, you’ll find these mashups permeating the gaming space, and Jadepunk: Tales from Kausao City is a standout example thereof. This is the West as wild as it gets, with full-bore steampunk meeting Wuxia excitement in the FATE system. Overthrow oppression in Jadepunk! You are the Jianghu – a loose society of likeminded, yet quarrelsome, individuals and organizations. Using powerful Jadetech devices and martial arts techniques, you stand against oppression and injustice. Though you are few, the Council fears you, for you have the most powerful weapon in Kausao City – the hearts and minds of the people. Unite them, and they will fight with you. An original setting that fuses the themes of Western steampunk and Asian wuxia. The “Storytelling System” of creating character aspects that immerses them into the setting. A comprehensive Asset system that lets you make any kind of device, martial arts technique, or companion you can imagine. New dueling mechanics that use the contest system for fast and furious combat that won’t have the rest of your group sitting idly by. Streamlined rules for gamemasters that give them the power to create scenes on the fly with the use of the “Scene Fractal”. A new way of creating minor NPCs that takes no prep time. “Faces” give you everything you need to make an unimportant NPC feel alive and memorable. What are you waiting for? The people call for warriors to champion them against the oppressive forces of the Council of Nine. Take up your Jadetech weapon, prime the engines on your airship, and lead the fight for justice! Copies sell on Amazon $125 or more, making the recent release of Boot Hill Wild West Roleplaying Game (3rd Edition) on DriveThruRPG a pretty big damn deal. Originally released in 1990, this was Steve Winter (with some help from Gary Gygax and Brian Blume, before the war between them changed everything) taking one last crack at doing a compelling Western-themed RPG for TSR… and by many accounts, succeeding very admirably. And, yes, it’s available in softcover print-on-demand. Welcome to Go West, Young Gamer Week! Two rows of unpainted wooden buildings face each other across the wide, dirt street. A signboard creaks mournfully in the hot wind. Down this track rides a lone figures, tired but alert. His boots, hat, and buckskin jacket are alayered with dust. But the ivory-handled revolver on his hip is spotless and cool. Neither a beacon nor a threat, it’s simply there, a part of the man. Drift back to the days of cattle drives, dance halls, range wars, and gunslingers. 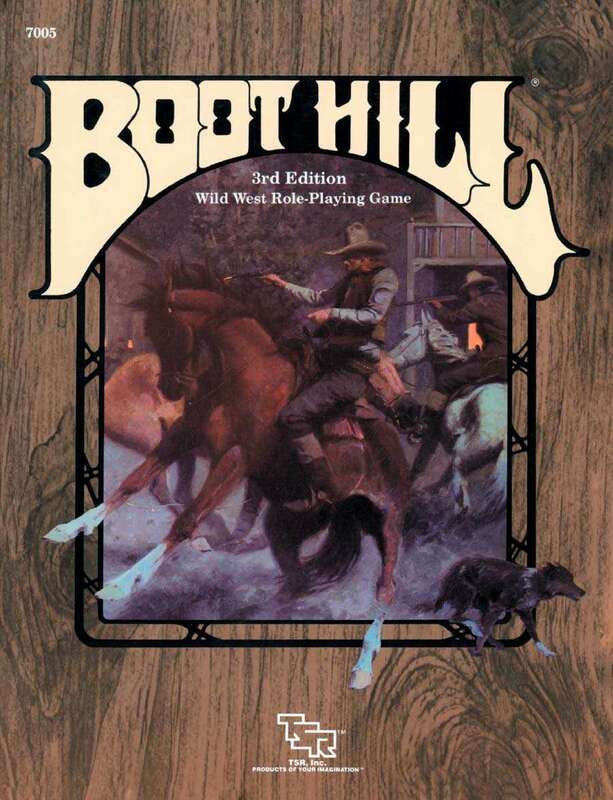 The BOOT HILL Wild west role-Playing Game lets you relive the grand adventure of the American Frontier. It’s a wide open land where a man with strength, determination, and courage can carve a place for himself. An old school D&D approach to playing Lovecraftian horror? Sounds like a great final Pick for Not My Dungeon, Not My Dragons Week, the celebration of all the other things you can do using the most popular and known RPG engine ever crafted. The direct link is through the free Stars Without Number version of the engine, but anyone who groks d20-driven games will be able to dive right into sandbox-style horror investigation with this much-liked game – Silent Legions. 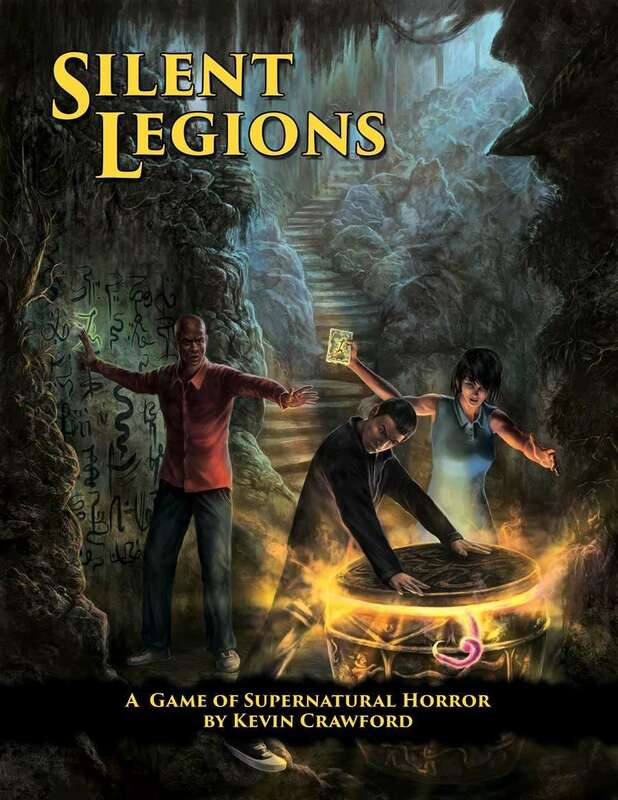 Silent Legions is a game of modern-day Lovecraftian horror, one carefully designed to support sandbox adventures by hard-bitten investigators and fearless hunters of the dark. Its clean, lightweight old-school rules are compatible with the free Stars Without Number sci-fi game and give both GM and players a steady framework for plumbing the unspeakable secrets of the eldritch night. Now, after a successful Kickstarter with more than 1,100 backers, a Kickstartercompleted a month early, this tome of dark secrets can be yours. So seize now upon this opportunity! Plunder this vault of forgotten lore. Grasp these dark tools of creation and wield their power to fashion your own nightmarish reality. Perhaps none dare name the things that await your animating will, but soon enough the world will know them well…. Like this game and want more? Grab some more compatible games from Sine Nomine, like the free edition of the Stars Without Number sci-fi RPG, the post-apocalyptic wasteland adventures of Other Dust, or the Africana-inspired fantasy of Spears of the Dawn. Though best known as a Savage Worlds joint, Gun Metal Games has gone to great effort to bring their Interface Zero setting to players of other game systems. This particular effort – today’s Pick for Not My Dungeon, Not My Dragons Week – is directly combined with RPG Objects‘ Modern20 rules hack for D&D. I don’t think Gary or Dave ever imagined cyberware, ultra-hacking the environment, or corporate machinations for their beloved fantasy RPG… but that just goes to show how creative you can really get with this stuff. 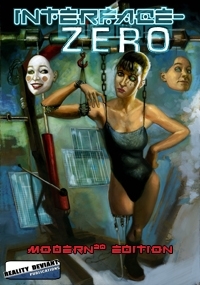 Interface-Zero, is the first book in the Interface-Zero Cyberpunk Setting by Reality Deviant Publications. IZ brings your Modern20 game up to speed with the dark, frenetic world of 2088. Future sourcebooks and adventures will further add to the bleeding edge setting presented in this core setting book. Within the pages of Interface-Zero, you can match wits with ancient triad lodge masters, anarchist hackers and digitized corporate moguls. Thwart the machinations of the New Chinese Mandarinate, or the Theocratic UCSA. Stare down the end of your gauss rifle at or match nano-woven steel with ganglanders, gene-spliced hybrids and borg shock troopers. * Armor, Equipment, Robots, Weapons and Vehicles! * Viruses, and Do-it-yourself programs! * New Cybernetics and Biogenetic Upgrade Rules! * Megaconglomerations and Rogue Nations-States! * Tips for Players and Narrators both new and veteran! 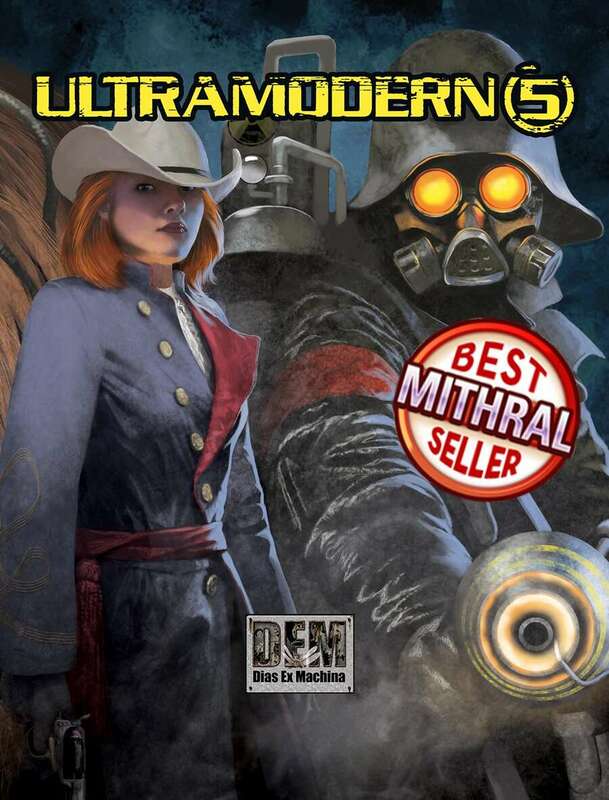 Today’s Not My Dungeon, Not My Dragons Pick is Ultramodern5, a rather popular “hack” that takes The World’s Most Popular RPG into all kinds of other genres. In this instance, we’re talking the Ultramodern update to 5e, which is designed specifically to let you with your own 5th Edition homebrew ideas. Continuing Not My Dungeon, Not My Dragons Week, wherein we look at ways the various iterations of the D&D engine has been used for very non-traditional settings and game experiences, here’s Guardians. 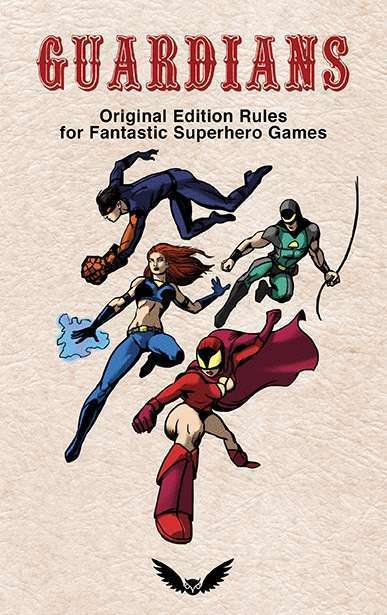 Recommended by friend and supporter Jeffrey Webb, Guardians is a highly-touted superhero genre game by David L. Pulver and Thomas Denmark that presupposes what the original rules would look like had the creators been inspired by four-color comic books instead of medieval fantasy. There are a lot of great reviews of the product, which many look at as a callback to Gamma World and other early, fun attempts at expanding the concept of gaming into other genres while keeping with the core game mechanics. What if the original roleplaying game was inspired by colorful superheroes rather than Tolkienesque fantasy? GUARDIANS is a super hero retro-clone compatible with the original fantasy roleplaying game and subsequent editions, and other “OSR” games that follow in the mould of the original game like Colonial Troopers, Warriors of the Red Planet, and others. If your tastes run towards super-powered four-color heroes and villains you’ve found the right book. In a tradition inspired by the psionic abilities of Eldritch Wizardry and the mutants of Metamorphosis Alpha or Gamma World, even a first level Guardians character begins with mighty powers! As we close in on the end of DriveThruRPG’s all-month-of-May D&D Sale, I am declaring this Not My Dungeon, Not My Dragons Week – a week celebrating some of the really interesting things folks have done with everyone’s favorite d20-driven mechanics, going to places other than dungeons and dealing with stranger things than dragons. 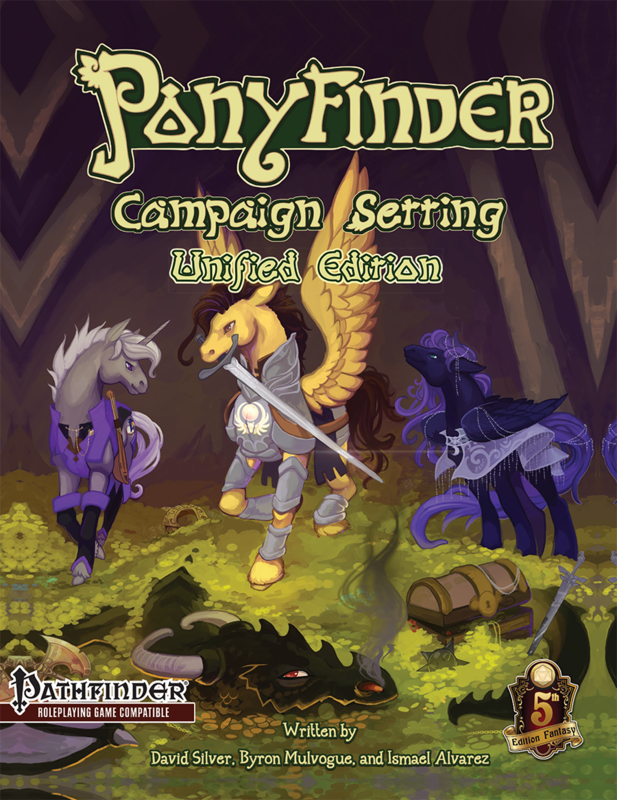 Enter Ponyfinder, a setting wherein equines and other four-legged species rule the land and humanoids are the secondary residents. We’ve brought ponies, griffons, felines, and other strange creatures to life in a world all of their own, where they are the primary PCs. Don’t want to run a game all about ponies? That’s alright! Use our post-empire suggestions to add ponies to any other existing world. Many spells, archetypes, and bloodlines are also usable by non ponies or other settings. Now compatible with 5th edition and Pathfinder roleplaying games! We wrap up Play the Fifth Week with another official Wizards of the Coast release for the system, and a perfect bookend with the first Pick. Dreams of the Red Wizards: Scourge of the Sword Coast directly follows up the events of Ghosts of Dragonspear Castle with revelations of other terrible unleashed upon the world. Those wishing to explore one of the wild, dangerous places of the Forgotten Realms will wish to delve deeply into the tales of this popular release. Ghosts of Dragonspear Castle chronicled the efforts of the Red Wizards to unlock the power of elemental nodes located in an abandoned temple dedicated to the Princes of Elemental Evil. A gate to the Nine Hells lay open for some time, spewing devils and smoke. The heroes who closed the gate could not know it then, but amid the chaos of battle, another threat emerged. Continuing the Encounters. The D&D Encounters program saw major changes beginning with Season 15’s “Murder in Baldur’s Gate” (2013). That was the first D&D Encounters book that was produced for broad sale — and so could be played at home or in a store. The commercial production of the adventure allowed for a higher-quality product, and also let the designers provide more detail on the setting. “Murder in Baldur’s Gate” was also the first Encounters season to notably move away from the trends of 4e play: though support was offered for 3.5e, 4e, and D&D Next, tactical maps were no longer a part of the D&D Encounters adventure. Season 16’s “Legacy of the Crystal Shard” (2013) followed these trends and made an even bigger change: the adventure was no longer separated into individual encounters; instead each D&D Encounters group could play it at their own speed. Season 17’s “Scourge of the Sword Coast” continued the revamping of the D&D Encounters program. Where the previous two adventures were print releases, “Scourge of the Sword Coast” was the first D&D Encounters adventure ever that was produced exclusively in PDF form; however, it continued to be sold commercially, now through DnDClassics.com It was also the first D&D Encounters adventure to exclusively support D&D Next play. Following a launch weekend on February 15-16, 2014, “Scourge of the Sword Coast” ran from February 19, 2014 to May 7, 2014. About the Homage. The revamped D&D Encounters adventures weren’t homages to classic D&D modules, as was the case during the early program. Nonetheless, “Scourge of the Sword Coast” was somewhat reminiscent of B2: “The Keep on the Borderlands” (1979): characters met many classic humanoids (including goblins, orcs, gnolls, and duergar) in individual encounter areas. Continuing the Sundering. “Scourge of the Sword Coast” continues “The Sundering”, a Forgotten Realms multimedia event meant to transition the setting to D&D Next. The Sundering was intended to “reshape” the Realms by banishing the realm of Abeir and ending the “Era of Upheaval” that began when Ao destroyed the Tablets of Fate in the first-ever Realms crossover, the Avatar event (1989). The Sundering was also a part of the two previous D&D Encounters seasons, “Murder in Baldur’s Gate” and “Legacy of the Crystal Shard”, and a series of six novels beginning with The Companions (2013), by R.A. Salvatore. As with most of the other Sundering tie-ins, it’s a minor part of “Scourge of the Sword Coast”, mainly acting as a background. Continuing the Story of Ghosts of Dragonspear Castle. Wizards of the Coast previewed D&D Next at Gen Con Indy 2013, which saw the release of Ghosts of Dragonspear Castle (2013), a book that combined the playtest D&D Next rules with a Forgotten Realms adventure set in and about the city of Daggerford. There, the Red Wizards of Thay sought four keys to free the Princes of Elemental Evil. Though the Red Wizards (hopefully!) failed in Ghosts of Dragonspear Castle, their story continues here as they bedevil Daggerford once more. 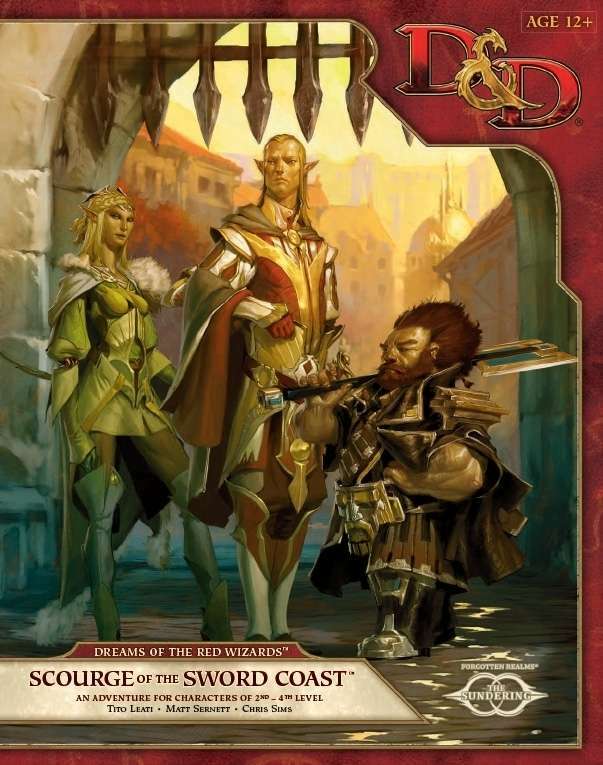 To a certain extent, “Scourge of the Sword Coast” is a direct sequel to Ghosts of Dragonspear Castle, continuing with some of the characters and the setting and exploring some of the repercussions of the earlier adventure. However, it can’t be run for the same characters, as Ghosts of Dragonspear Castle was meant to advance characters from level 1-10, while “Scourge of the Sword Coast” begins play at second level. The Adventure Continues: The story of “Dreams of the Red Wizards” continues in “Dead in Thay” (2014). Expanding the Realms. Daggerford has been a classic area for introductory Forgotten Realms play ever since the release of N5: “Under Illefarn” (1987). More broadly, the Sword Coast has been one of the best-detailed areas in the Realms since first-edition days. Thus it’s appropriate that Ghosts of Dragonspear Castle and “Scourge of the Sword Coast” return to this fertile land.